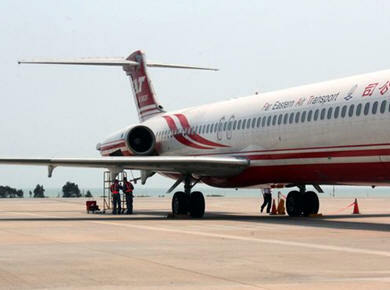 September 10, 2013 - China’s Civil Aeronautics Administration (CAA) which is responsible for the regulation of all civil aviation activities in the Republic of China has fined two pilots of Far Eastern Air Transport (FAT) airlines for landing an aircraft below fight minimums. On May 19, a Far Eastern Air Transport aircraft had departed Taipei International Airport with its pilot, copilot, four cabin crew members and six passengers for Magong Airport in Penghu, Taiwan. According to the CAA, the clouds were below landing minimums making the runway close to invisible for the pilots to land their aircraft at Magong Airport. While other aircraft had decided to land at their alternate airports the pilots of Far Eastern Air Transport decided to take the chance and land their aircraft. Fortunately the pilots were able to land their aircraft with six passengers onboard despite the adverse weather conditions. However, the CAA reports the pilots put their passengers at risk by not following standard operating procedures. The CAA has fined both pilots $60,000 each. A CAA flight standard section chief reported that the pilot admitted his actions were risky and he simply wanted to see if he could land the aircraft without having to fly his aircraft to an alternate airport which he said was risky as well. Far Eastern Air Transport (FAT) is a Taiwan air carrier with offices in Taiwan, Songshan District, Taipei and the Republic of China. It began services in Taipei in 1957. Since that time the company has seen turbulent times. In 2008, the company had filed bankruptcy and discontinued all flights. In 2011, the company received capital funding and began flight operations.